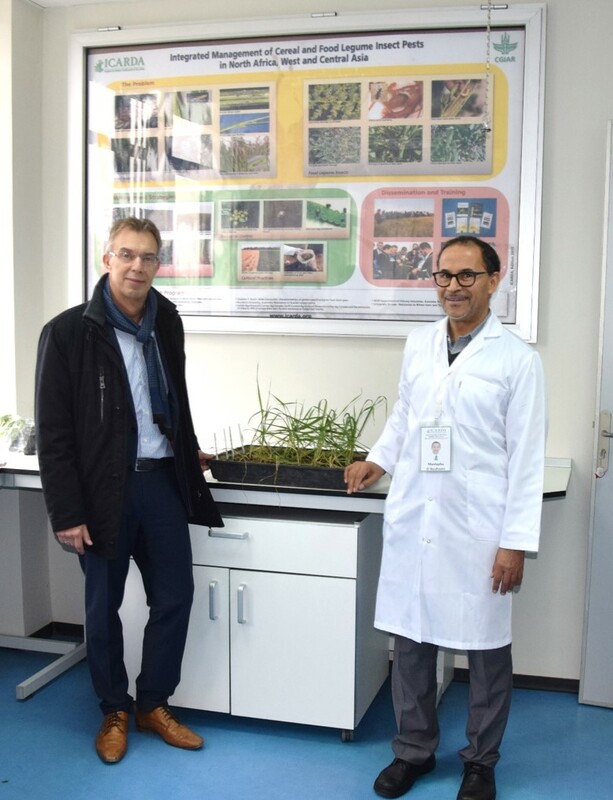 Pictured are Martin Kropff, CIMMYT director general (left) and Mustapha El-Bouhssini, ICARDA entomologist, in that center’s lab at Rabat, Morocco. 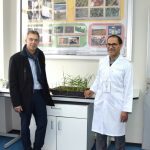 In an excellent example of scientific collaboration spanning borders and generations, Mustapha El-Bouhssini, entomologist at the International Centre for Agricultural Research in the Dry Areas (ICARDA), screened wheat breeding lines from the International Maize and Wheat Improvement Center (CIMMYT) under glasshouse infestations of Russian wheat aphid (Diuraphis noxia), a major global pest of wheat. At least one of the lines, which were developed through crosses of wheat with related crop and grass species, showed high levels of resistance. Scientists at CIMMYT began research on sources of RWA resistance for wheat in the early 1990s. Good sources of resistance from rye were accessed via wide crosses that combined major portions of both crop’s chromosomes, in collaborative work led by Adam J. Lukaszewski, University of California, Riverside. “In our experiments, we did an initial screening with one replication and then a replicated test with a Pavon line and the check,” said El-Bouhssini. Pavon is a semi-dwarf wheat variety developed by Sanjaya Rajaram, former CIMMYT wheat director and 2014 World Food Prize laureate. The version of Pavon referred to by El-Bouhssini had been crossed with rye by Lukaszewski and entered CIMMYT’s wheat genetic resource collections; the check was a popular high-yielding variety with no resistance to Russian wheat aphid. Pavon had been used by Lukaszewski and colleagues as a model variety for wide crosses to transfer pest and disease resistance to wheat from its distant relatives. More recently Leonardo Crespo-Herrera, CIMMYT wheat breeder, pursued this research for his doctoral studies. It was he who provided a selection of wide-cross lines to El-Bouhssini. The resistant wheat line (center) is green while all others have perished under heavy infestation of Russian wheat aphid, in the ICARDA entomology lab at Rabat, Morocco.